Our Nanuya Island Resort Blog will keep you updated and informed as to events and happenings at the resort. We'll tell you where to go! For our Nanuya family and the people living in surrounding villages, support for the rugby code and especially the Rugby Sevens is HUGE! The Fijian way of life revolves around a passionate embrace of the game, its players and the teamship and camaraderie it brings to players and supporters alike. WELCOME HOME TO OUR NEW GENERAL MANAGER! The family at Nanuya Island Resort have recently welcomed a new General Manager but this one is truly different. The Yasawa Islands are known the world over for its amazing and colourful sunsets and there is no better place to view them than from Nanuya Island Resort. …and to make the experience even better, Nanuya Island Resort has welcomed its very own resident band – The Sunset Boys. The Yasawa Islands of Fiji, is blessed with some stunningly beautiful coral reefs but is, as are many similar areas around the world, in a battle to preserve these awesome natural wonders. 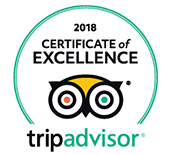 BREAKING NEWS FROM NANUYA ISLAND RESORT! 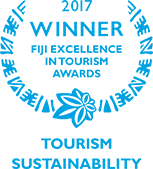 It was a special night for the owners of Nanuya Island Resort on Saturday February 17th 2018 – they were honoured with the prestigious Sustainability Award At the 2017 ANZ Fiji Excellence in Tourism Awards (FETA) held at the Sheraton Denarau. It’s 2018 and our Nanuya Family are welcoming in the New Year, here in Paradise. It’s a great time at Nanuya Island Resort, as we prepare to welcome guests for another 12 months of relaxation, exploring and pampering.